Bill Tonnis is a Pastoral Minister, fully trained chaplain, retreat presenter, music minister, singer-songwriter, former Youth Minister, former radio news anchor, imperfect follower of Jesus who is inspired to share God’s unconditional love, mercy, and grace for all. He is a Thomas Merton-inspired-contemplative who is passionate about practicing presence, building bridges and helping people become their true selves. Bill Tonnis wants to use his music, his ministry and his personal testimony to ignite the passion of God’s love in the hearts of all who hear him. In so doing…Bill hopes to encourage others to listen to their hearts, live to love and give of themselves in the service of God’s on-going creation. For many years, Bill Tonnis (pronounced toe-nis) was a popular name for radio listeners in Cincinnati, Ohio. Born and raised in Cincinnati, Bill is a graduate of Elder High School and Xavier University where he earned a Bachelor of Science degree in Broadcast Journalism. Experience as a news anchor and reporter consumed much of his life. He wanted to be “somebody” but also appreciated the anonymity behind the microphone. He was much more “realistic” than he was “optimistic”, but was always searching for something more… the next big story. As a young adult, he was evolving and changing but was also realizing that his legacy in radio broadcasting was leaving him empty and unfulfilled. In 1997, while immersed in an exhausting week of reporting on the devastating flood of the Ohio River, Bill experienced a profound sense of emptiness and sadness. It was if he was drowning in misery. On the Friday afternoon of the first week of March, Bill cried out to God in desperation and surrendered himself admitting that he was unable to fill the gaping hole in his heart on his own. In prayerful silence, Bill heard a silent voice asking him to pick up his guitar. He had not touched his guitar in at least ten years! From there…he started writing spiritual songs with a new sense of purpose. However, making the transition from newsman to music man was not without its challenges. Bill suffered from a couple of health issues through which he was transformed. Surviving a life threatening illness ultimately led him to a spiritual awakening which pushed him one step further not only toward music but a period of discernment. Not long thereafter, (while still working at the radio station), he entered the College of Mount St Joseph and pursued a Masters in Religious & Pastoral Studies degree hoping to inspire his songwriting. During this time, Bill also joined a church band called CELEBRATE. In 2003, CELEBRATE recorded a CD which included several of Bill’s original compositions. Ironically, CELEBRATE was scheduled to perform one of their biggest events to date on the very day that the tragedy of 9/11 occurred. The event went on as planned but instead of being behind the news microphone that night, Bill Tonnis was behind a stage microphone spreading the good news and hope of the unconditional Love of God and Jesus Christ through music and prayer. In 2007, Bill released his debut CD titled LISTEN TO YOUR HEART. In a literal translation he took this message seriously and resigned from a successful career in radio broadcasting to pursue a new direction in his life. The CD was well received. His follow-up CD, titled LIVE TO LOVE was released in 2009. Then in 2013, Bill’s third album titled GIVE PRAISE AND THANKS was released. The songs on these projects represent a variety of musical styles, but the constant theme is that it is never too late to find YOUR voice…to become your “true self” and to help make the world a more compassionate, just, and loving place. Bill’s 4th album titled MERCY REIGNS was released in 2017. It stems from his experience in chaplaincy and offers comfort and healing to all those going through struggles. Today Bill Tonnis works as the Pastoral Associate for Outreach at Our Lady of the Visitation Church. 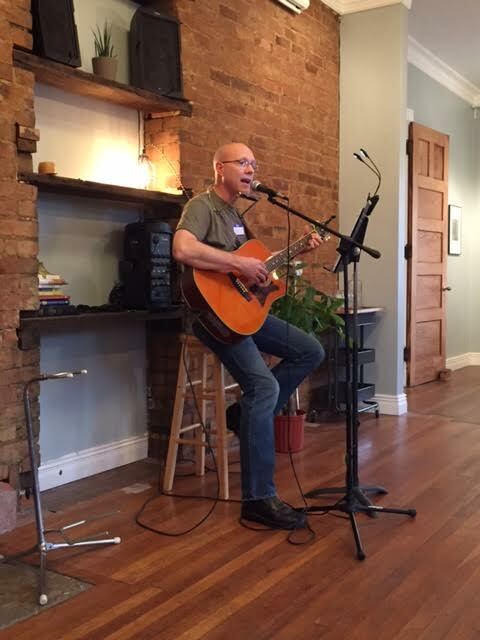 After five years as the Youth Minister, Bill completed the full training for chaplaincy (Clinical Pastoral Education) and shares his music with shut-ins, nursing home residents and in jail ministry as well. Bill oversees social justice and service programs for his parish. He also shares his talent and testimony at concerts, schools, churches, meetings, conferences, youth groups and retreats. By God’s grace…Bill has gone from delivering bad news on the radio…to Good News to all who will hear it!